I recently decided to sign up for this great new program in DC called Capital Bikeshare. You simply pay an annual/monthly/weekly/daily membership fee and are able to rent (for your desired time) bikes from bike stations all over DC. You pick up at one station and drop off at another station. If I want, I can cab/metro home on my return trip if its too late or dark. A nice freedom with the ability to just drop off the bike without a care. And with the rash of bicycle thefts in the District, this is a great alternative to owning my own bicycle. The stations are located all over the District and even in NoVA and are solar powered. So Eco-friendly. And they want to create more stations! You can see it already, the streets are full of bicyclists and its a great thing to see a city turn so Bicycle friendly in such a short time. The Express last week even talked about Bicycle traffic ... which is kinda cool even though its traffic. The movement towards bikes are picking up and I joined the movement! While the city is becoming more bicyclist-friendly, the drivers here are still unaware. I'm guilty of this as I don't know the rules for sharing my lane with a bicyclist... especially in a city where if you leave a little room, another car will come swooping in... so I am prepared. 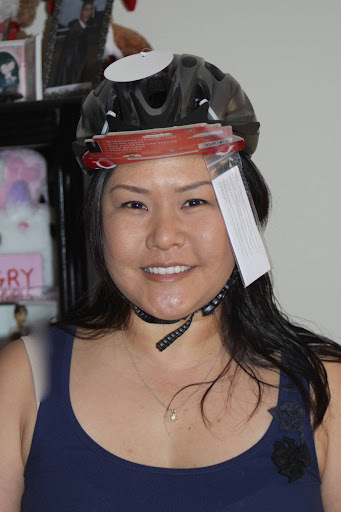 So there are many reasons i am wearing my helmet, but above all - I know I can ride a bicycle safely, but I can't control the drivers, the pedestrians, the other cyclists and how vulnerable I am on a bicycle... so I have to be defensive and offensive while on the bicycle. I'm also getting to know the various bicycle routes around here... so I use this bicycle map! So i've yet to try out the program, it's been rainy in the District, but I am looking forward to biking to yoga classes in Dupont or Bloomingdale and feeling the freedom that having a bicycle will give me! Do you bike? Or part of a similar program? Any suggestions or tips? I like the bikeshare program idea. In Miami you have to wear a helmet. Unfortunately we have several deaths in my district alone from motorists not sharing the road ways with cyclists. Happy biking...kudos on being safe!